Acupuncture is totally harmless when compared to western medicines which could cause reactions or side effects. 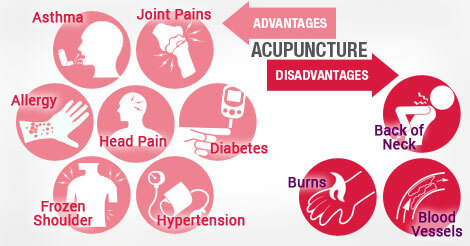 Acupuncture is very useful for treatment in most chronic disorders. It is very effective in the treatment of the bronchial asthma, diabetes, residual paralysis of polio, deafness, arthritis–joint pains, back–ache, cervical spondylosis, head pain, osteoarthritis, knee joint, frozen shoulder, hypertension, sciatica, hemiplegia, paraplegia, migraine, speech disorders, allergy, epilepsy, cerebral palsy, mental retardation, insomnia and many other conditions. Points on prominent blood vessels. Side and back of neck. Umbilicus (moxibustion and cupping can be done). Malignancy treatment is under trial. Mechanical obstruction like intestinal obstruction, foreign body in nose volvulus etc. Surgical indications like fracture, dislocation harelip, cleft palate. Very old, dying and debilitated patient. Pain due to blunt, hooked or forgotten needle. Pain due to unskilled acupuncturist or anxious patient.